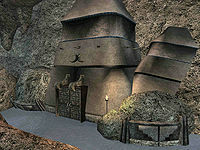 Teran Hall is a ruined building in Old Mournhold. This is the area where you find the two Altmer trainers (Yarnar and Armion) in the Goblin Army quest. There are also many goblins and durzogs which infest the hall. The two trainers can be found in the bottom of Teran Hall's East Building which can be accessed from the Residential Ruins. 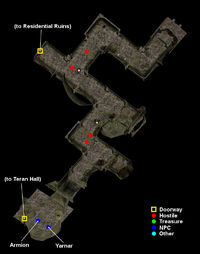 Alternatively, you can reach the area from the bottom of Teran Hall, behind a locked door. There is a pit covered by a rug, dropping down a level. There's an Invoice hinting as to why it is there. On the upper level behind the rug there is a Adamantium spear, next to a Bonemold Shield. This page was last modified on 8 September 2018, at 04:37.